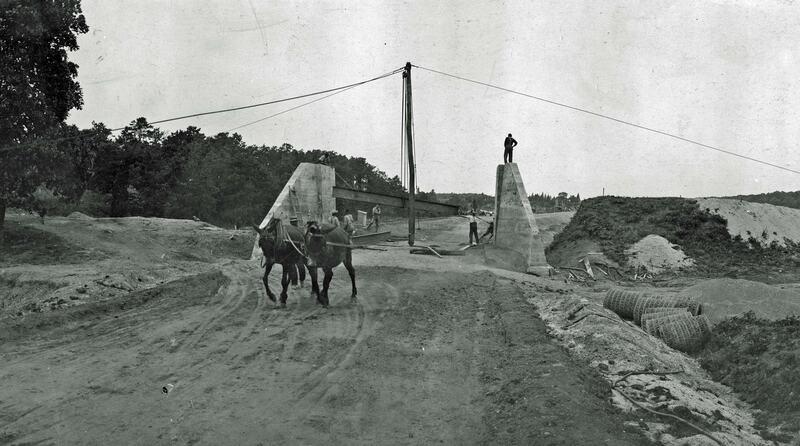 The building of the Motor Parkway was well documented by photographers throughout the summer of 1908. 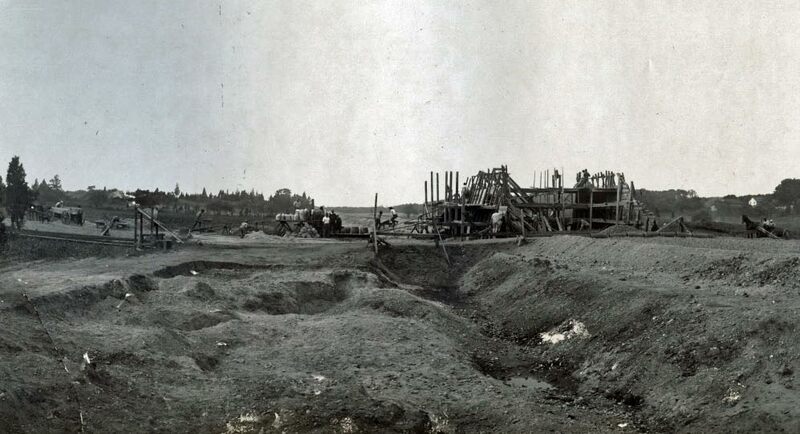 The best compilation of these construction photos was found in a scrapbook Vanderbilt's Long Island Motor Parkway. This scrapbook containing over 200 images was donated to the Garden City Public Library by Mrs. D.E. Whitten. 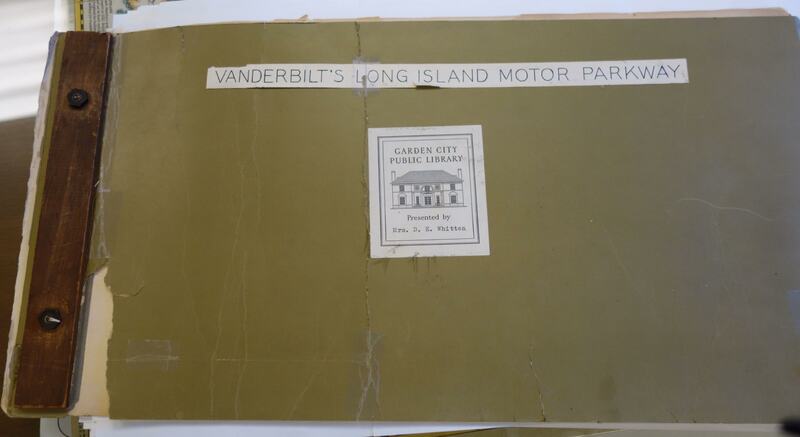 The Garden City Archives has given VanderbiltCupRaces.com premission to post these rare images. 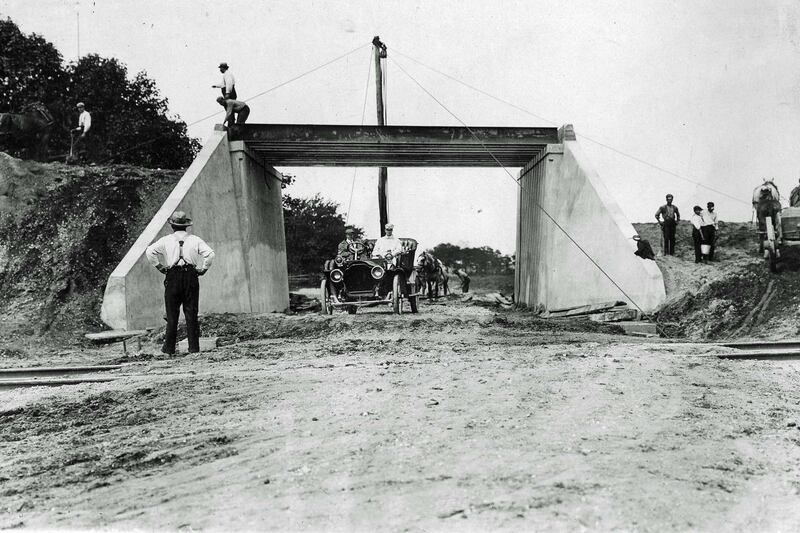 In the first of the series, photos and captions of the construction of five Motor Parkway bridges are provided. The scrapbook was donated to the Garden City Library by Mrs. D.E. Whitten. The link between the Motor Parkway and the Whitten family is currently unknown. Can anyone provide the link? Caption: Motor Parkway at Central Avenue and Railroad crossing train going through. This shows the heights. The bridge will be high for the train to pass under. Caption: All working at Central Park bridge. Caption: Pushing things at Central Park Bridge. 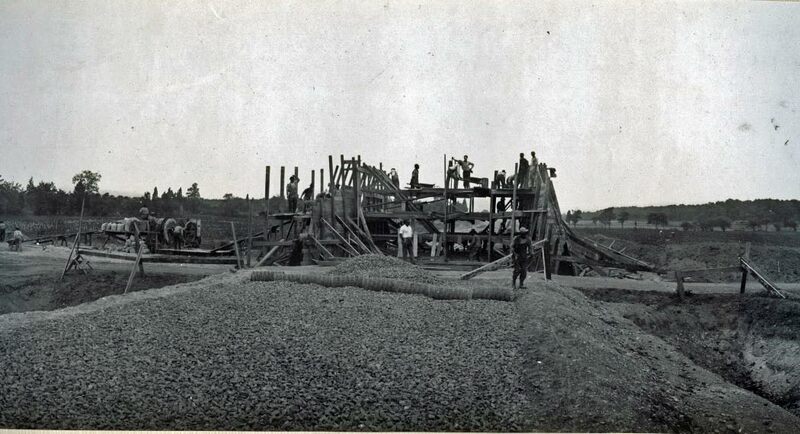 Caption: Lumber frame work of forms in which cement is dumped. 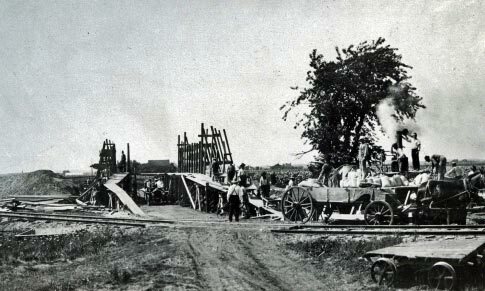 Caption: Raising the first beam for the construction of one of the bridges at Central Park. Caption: This shows the grade and extent of the work. At this point the parkway goes under the cross roads. This is one of the bridges in course of construction. 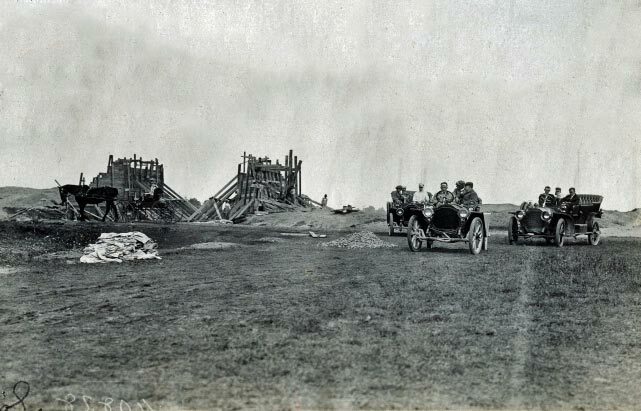 Caption: One of the bridges in course of construction for the parkway, showing the wooden moulds, the mixing machines for the cement and stones. Also shows the crushed stone parkway wire netting that goes between the layers of stone. This also gives the idea of the beautiful farm land that the parkway goes through. 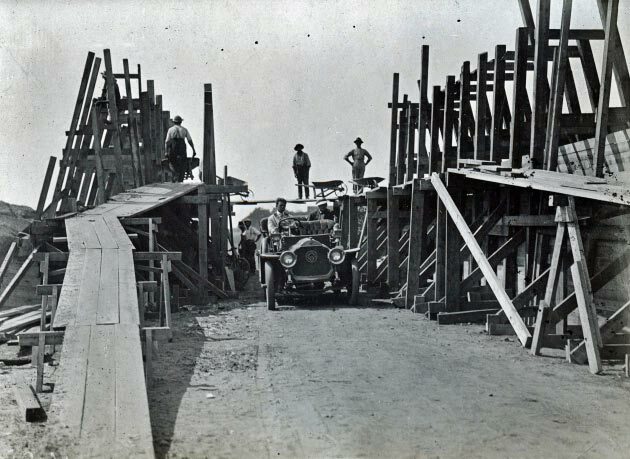 Caption: The concrete construction gang at work on one of the bridges. 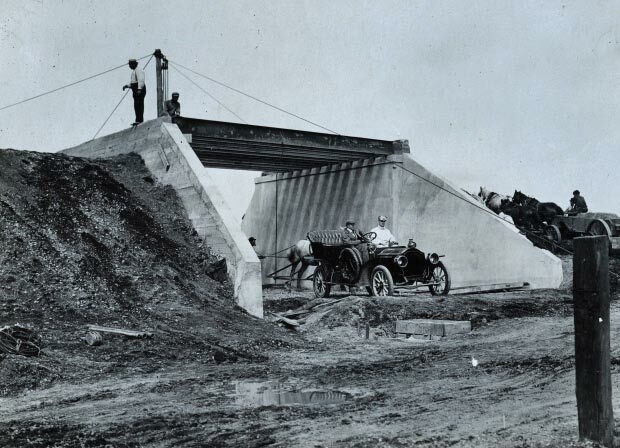 Caption: Showing the most incomplete bridge. Great pics. These guys were workers. This weekend the Ellison ave bridge finally reopened. These workers here built about 40 bridges in the amount of time it took current guys to replace one. I was at the New Hyde Park road former bridge site today. Just on a run but I realized there is still concrete on the abutment facing NHP Road heavily covered with brush. I wonder if the date inscription is still there.